We offer the most complete experience. Combined visit to the Alcázar and the Guadalquivir river. 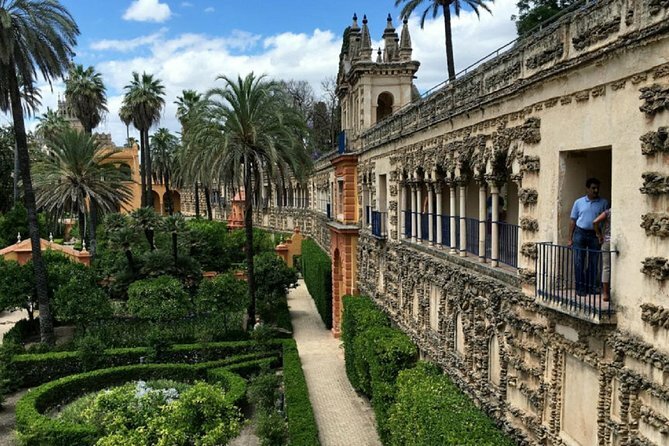 Discover the Alcazar, visit this royal house in a queue without queue for an hour and a half with an official guide. Look for the beautiful gardens that are on 7 hectares and has botanical species from around the world. After that, you can relax in our exclusive 20m fulll equipe yacht (living room with air conditioning and heating, sofa on the upper terrace, bow and bar, bar service, piped music, etc.). Stroll in 90 minutes with the better views. from the city. We show you the city from the air with our 3D glasses; And you will taste our delicious "chacina" (ham, cane loin cane) and taste our famous Rebujito drink. Definitely a different way of knowing the city. Diríjase al muelle de Nueva York a orillas del Guadalquivir. Relájese en un exclusivo yate totalmente equipado con aire acondicionado, calefacción, terraza superior, música y servicio de bar. Disfruta de excelentes vistas del río mientras saboreas delicias ibéricas como el lomo, el queso, las salchichas y un vino tradicional elaborado en la región. Disfrute de la entrada sin colas a una de las 6 mejores atracciones históricas de España. Realice un recorrido de 1 hora y 30 minutos con un guía experto a través de la residencia real más antigua y compleja de Europa. Conozca las diversas culturas que conforman la historia de la ciudad y que vieron florecer a la Sevilla romana, visigoda y árabe. Al final del tour, disfrute del tiempo libre para admirar los hermosos jardines que cubren 7 hectáreas y cuentan con especies botánicas de todo el mundo. We guarante to avoid long queues. If you get a 8 people group, it will be charged 1€ per person and monument. That will be paid in the entrance. Confirmation will be get in 48 hours from the reservation. Depends on the availavility. We will recomned yo to stay there 10 minutes in advanced. subject to favorable weather conditions; If due to the weather we have to cancel the trip, we will give you an alternative date o the whole refund.